Imaging being the guy that invented those little yellow or white road studs, you know, the ones that make that vibrating sound when you drive over when changing lanes. There must be about centillion of those things lining streets across the world. Does anyone know how many of those have been made or are on the roads across the world? I’d love to know! Anyways, that’s not what this post is about, it’s about how high-tech those studs are getting. Astucia Traffic Management Systems, a UK based company, known for building some very impressive traffic management systems and controls, now have Intelligent Road Studs to add to their arsenal. 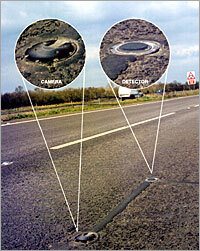 The system is comprised of a camera stud, vehicle detection stud, and a lane management stud. This is where it gets pretty scary, and very cool, the camera stud uses a high-definition camera located within a heavy-duty road stud. It provides a central view of the road in all weather conditions and has high-definition still or moving images of oncoming or departing vehicles and automatic number plate recognition. Now, put that together with the detection stud, which provides highly accurate information including vehicle speed, vehicle length, and number of axles, and you’ll never be able to get out of a speeding ticket — ever!